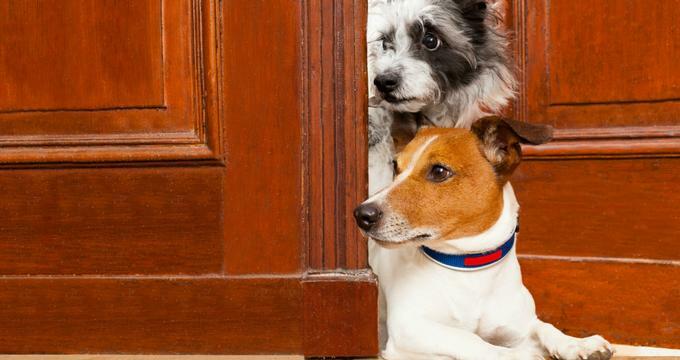 When it comes to your furry friends, going on holiday without them might not be an option, however, there are plenty of hotels that welcome your four-legged companions and are happy to accommodate them in style. From the luxurious Peninsula Beverly Hills, where you can take up to five pets per room, to the luxurious Benjamin Hotel in New York, which provides a signature Mungo & Maud water bowl and a special BarkBox filed with goodies according to the size of the dog. Here is a list of some of the top hotels to enjoy with your pet. Set in a magnificent beaux arts-style building that dates back to 1927, The Benjamin is an iconic New York landmark hotel that offers a luxurious retreat for both people and pets. 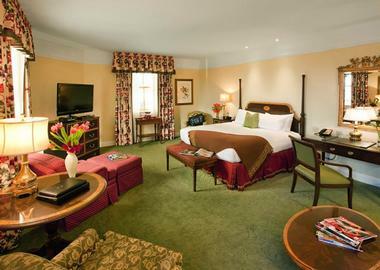 Situated just three blocks from the Rockefeller Center and a short walk from Grand Central station, the deluxe hotel features stunning guest rooms decorated in conservative colors, with marble bathrooms, kitchenettes, modern amenities, and private outdoor terraces with spectacular city views. The Benjamin is home to a stylish restaurant that serves a bistro-style menu, a fully equipped 24-hour gym, a beauty salon, and business center. The Benjamin offers a superior pet program for guests traveling with their four-legged friends, which includes an assortment of welcome amenities, an in-room pet mini-bar, and a BarkBox specific to the size of the dog, including healthy treats and hygiene products. Pets are also treated to a signature Mungo & Maud bed and water bowl for use during their stay. 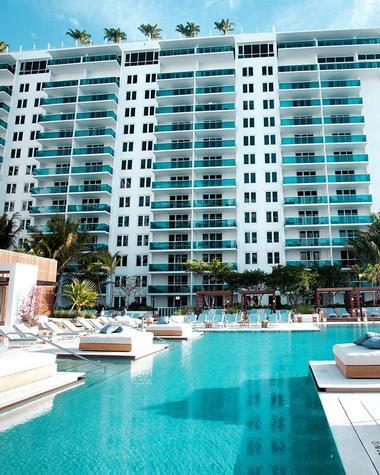 1 Hotel South Beach is an upscale beachfront hotel a few roads back from the seafront in South Beach Miami and a short walk from the Lincoln Road Mall and Bass Museum of Art. This stylish hotel offers light and sophisticated rooms with contemporary décor, custom-designed beds, Nespresso machines, and beautiful ocean views. Upgraded suites have private balconies, and apartments boast fully equipped kitchens. Hotel facilities include an exclusive spa and fitness center, four swimming pools, rooftop and lobby bars, and a Tom Colicchio-run restaurant with outdoor terrace seating. Pets are welcome at 1 Hotel South Beach, which offers pet-friendly services such as comfy beds, bowls, and dog walking and dog sitting services. 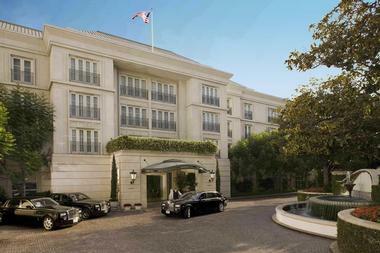 Located in Beverly Hills, The Peninsula Beverly Hills is a luxurious five-star hotel within easy walking distance of the Museum of Tolerance, the Hammer Museum, and University of California Los Angeles. The pet-friendly hotel boasts 195 air-conditioned rooms with en suite bathrooms and modern amenities, including 42-inch LCD satellite televisions, iPod docking stations and minibars, and first-class facilities such as an exclusive spa, an outdoor swimming pool and spa tub, a steam room, and four restaurants. Additional features at the hotel include a variety of concierge services, a business center, and complimentary wireless Internet access, and pets are welcome with a maximum of five pets allowed per room. Tucked away in the beautiful Carmel Valley, Carmel Valley Ranch is a pet-friendly hotel that offers a tranquil escape from the hustle and bustle of the big city for both dogs and people. 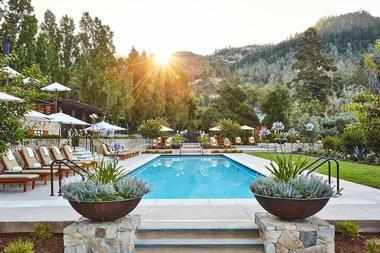 Surrounded by the spectacular natural beauty of the valley, the ranch-style hotel offers comfortable accommodations with private bathrooms and modern amenities together with upscale facilities such as an exclusive spa, an 18-hole championship golf course, personal fitness classes, and tennis courts. Outdoor activities such as hiking, mountain biking, wine tasting and unique honey bee experiences can be enjoyed, and there are plenty of places for long walks with your dog. Services for pets include microfabric dog beds, specialized pet menus, and miles of hiking trails. Surrounded by the rolling hills and patchwork vineyards of the Napa Valley, Calistoga Ranch is an upscale resort that welcomes pets. Set on 157 acres of beautiful landscapes and just a short drive from the Old Faithful Geyser in Yellowstone National Park, the resort features elegantly appointed cedar lodges with outdoor living rooms with fireplaces, en suite bathrooms, and modern amenities such as entertainment centers and complimentary wireless Internet. Facilities at the resort include a private lake and vineyard, which are ideal spots for walking dogs, an outdoor swimming pool, a fully equipped gym, an exclusive spa, and a wine cave. An onsite restaurant serves delicious wine country cuisine and has an outdoor deck with breathtaking views of the valley. 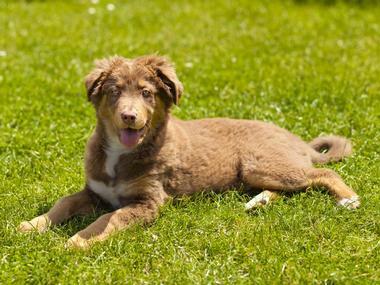 Calistoga Ranch welcomes pets for an additional fee, and they must be on a leash at all times. 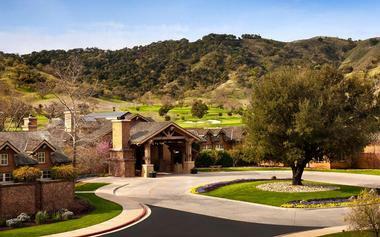 Nestled in the scenic wine country of the Santa Clara Valley, Rosewood CordeValle is a luxurious golf and spa resort located just 7 miles from downtown Gilroy. The hotel offers charming, pet-friendly country-style rooms and suites with private bathrooms, whirlpool tubs, wet bars, and fireplaces. The hotel features an upscale Italian restaurant with lovely views over the valley and a cozy bistro serving local fare. Deluxe facilities include a luxury day spa, a gym and outdoor swimming pool, business facilities, tennis courts, and an 18-hole golf course. Rosewood CordeValle welcomes pets with an array of services for fur-kids, such as Rosewood CordeValle bedding for dogs, food, water, and doggy treats in the room, and dog walking and dog sitting services. The Little Nell is a chic ski-in/ski-out resort on Aspen Mountain with easy access to the Silver Queen Gondola and the Aspen Art Museum. The hotel boasts stylish, contemporary rooms and suites with marble bathrooms, fireplaces, and modern amenities such as iPod docking stations, flat-screen TVs with Blu-ray players, and complimentary wireless Internet. A fine dining restaurant and a casual tavern serve a variety of cuisines and three bars offer vibrant entertainment, while other facilities include a day spa, an outdoor swimming pool and hot tub, a ski concierge, and loaner bikes. The pet-friendly hotel offers special doggy services such as epicurean treats and a special pet menu, bowls, beds and a Puppy Jet Lag Kit for altitude adjustment as well as dog walking and dog sitting services. Pines Lodge is a family and pet-friendly ski-in/ski-out resort on Beaver Creek Mountain just a few miles from Vail Village in Colorado. The upscale hotel features well-appointed guest rooms and suites with private bathrooms, modern amenities such as flat-screen televisions, and balconies with breathtaking views, while condos have kitchens with washer/dryers and hot tubs. 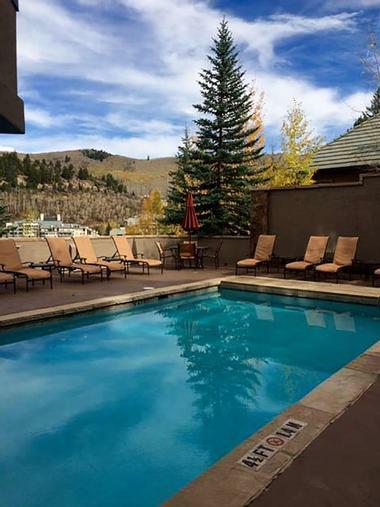 Seasonal amenities at the resort include a heated outdoor swimming pool and hot tub, an exclusive day spa, a fitness room, an inviting restaurant, and free ski storage facilities. The Pines Lodge offers a limited number of dog-friendly hotel rooms and condos, which need to be booked in advance. 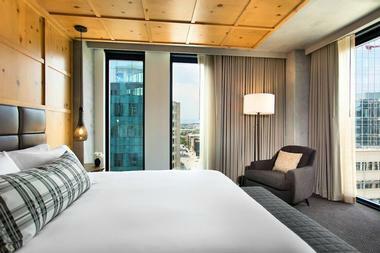 Located in the historic LoDo neighborhood with beautiful views of the Rocky Mountains, the Kimpton Hotel Born is a contemporary hotel that offers a variety of pet amenities and services. Situated a short walk from Union Station and the riverside Confluence Park, the family and pet-friendly retreat features bright rooms with wood-paneled walls, floor-to-ceiling windows with city or mountain views, and modern amenities. Hotel facilities include two casual restaurants, a fully equipped gym, and complimentary bicycles to explore the city and in-room massages and room service are available. Pets are a priority at the Kimpton Hotel Born, with specialized services such as a director of pet relations to take care of any issues, a selection of hotel amenities, including plush pet bed loaners, healthy food, water bowls, and mats. Also supplied is a list of nearby pet-friendly restaurants, parks, groomers, and pet boutiques as well as courtesy bags for walking your dog. Set on Mystic Harbor just a mile away from Mystic Seaport and Williams Beach Park, the Harbour Inne & Cottage is a charming, maritime-themed bed-and-breakfast that welcomes children and pets. The inn features cozy, wood-paneled guest rooms with en suite bathrooms, whirlpool tubs, and modern amenities, and a private cottage offers a kitchen, fireplace, open-air deck, and separate hot tub. Upscale facilities at the inn include a pretty waterfront gazebo, a guest kitchen, a comfortable lounge with a fireplace, and an outdoor deck with a hot tub and gorgeous ocean views. A delicious homemade breakfast is served every morning, and the inn welcomes pets, which can be accommodated for an additional fee. Set in a beautifully maintained 1926 beaux arts building in the heart of Washington, The Jefferson is a luxurious five-star hotel that welcomes pets. 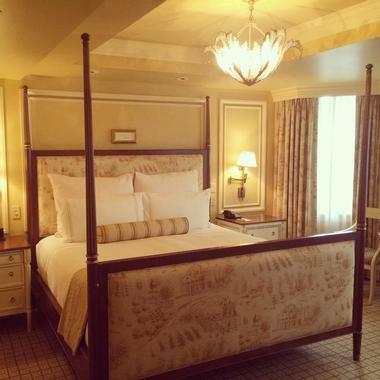 Located less than a mile from the White House and a short walk from the Washington Monument, this posh hotel features sophisticated guest rooms with period décor and furnishings, en suite bathrooms with Italian marble bathtubs, and living rooms with roaring fireplaces. Upscale amenities include a fully equipped fitness center and day spa, an opulent fine dining restaurant, a casual breakfast and lunch bistro, an elegant bar with terrace seating, and 24-hour butler service. The Jefferson welcomes up to two dogs of any size, and pet amenities include dog beds, bowls, and special treats. Designed in a modern, minimalist style and located in the heart of Key West, the Gates Hotel is an upscale retreat that offers an exceptional stay for furry friends. The hotel features well-appointed, chic guest rooms with platform beds, en suite bathrooms, and modern amenities such as Keurig coffeemakers, minifridges, and complimentary wireless Internet. Upgraded rooms have private terraces with stunning views and pull-out sofas for additional guests. Hotel facilities include a permanent food truck serving Key West/Caribbean cuisine and a casual rum bar offering signature cocktails, along with a cigar lounge, an outdoor swimming pool, and bikes for exploring. Pets are welcome and beds and bowls for supplied for guests with animals. Tucked away amidst 750 acres of cypress and pine forests in Lake Buena Vista, Disney’s Fort Wilderness Resort & Campground takes visitors on a journey back in time to life on the American frontier. The resort features comfortably furnished family and pet-friendly accommodations in the form of private cabins with living rooms, bedrooms, fully equipped kitchens, and private patios. Facilities include an outdoor swimming pool with a waterslide and a whirlpool spa and an onsite restaurant and musical revue bar. Pampered pets are welcome to stay with a variety of pet-friendly services, such as day care and dog walking, bowls, courtesy bags, special treats, and more. 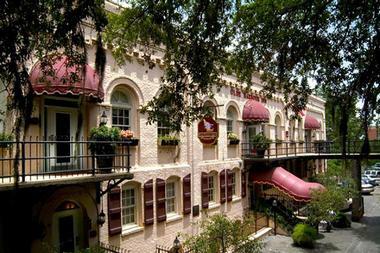 Located on the banks of the Savannah River, Olde Harbour Inn is a beautifully appointed boutique hotel situated in the heart of one of Savannah's most vibrant neighborhoods that welcome pets and other furry friends. The Olde Harbour Inn features beautifully appointed suites with hardwood floors, large windows that embrace beautiful views, and modern conveniences. Amenities at the inn include a complimentary gourmet breakfast, a cheese and wine reception every evening, free bottled water, daily newspaper delivery, and complimentary high-speed wireless Internet. The inn welcomes pets and offers a range of pet-friendly services, such as food and water bowls for the rooms, dog walking services and advice on where to walk your dog in the city, and a list of pet-friendly eating establishments around the hotel. 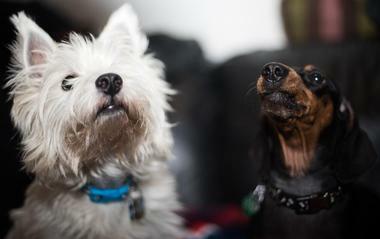 The Dog Bark Park Inn B&B is a dog-lover’s paradise and doggy heaven. Located in the city of Cottonwood, this unique bed and breakfast has been explicitly designed for dog loving people who are traveling with their furry friends. 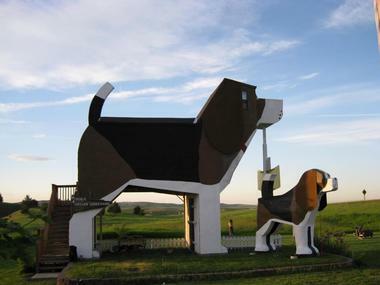 Built in the shape of a giant beagle known as Sweet Willy, the bed and breakfast offers one comfortable pet-friendly guest room with a microwave, minifridge, and coffeemaker and a private bathroom. A delicious complimentary breakfast is served every morning, and the 2-acre property features large sculptures such as a fire hydrant and a coffee pot and plenty of grass for dogs to enjoy. This quirky bed and breakfast is a mile from the center of Cottonwood and a few miles from the Historical Museum at St. Gertrude. The Kimpton Hotel Palomar Los Angeles Beverly Hills is a luxury hotel in the heart of Beverley Hills that offers a unique retreat. Located a short walk from the Getty Center, Santa Monica State Beach, and the Hammer Museum, this upscale, chic hotel features contemporary rooms with hip, colorful décor, minibars, and iPod docking stations as well as spectacular views of the city. In-room spa services and massages are available, and luxurious facilities include a vibrant restaurant serving seasonal menu and cocktails, an outdoor swimming heated pool with a patio and a fireplace, a fully equipped fitness center, a business center, and loaner bikes for exploring. The Kimpton Hotel Palomar Los Angeles Beverly Hills loves pets and offers a range of amenities and specialized services, such as healthy food, water bowls and mats, plush pet bed loaners, courtesy bags for walking your dog, and a list of nearby pet-friendly restaurants, parks, groomers, and pet boutiques. There is also a director of pet relations to take care of any issues. 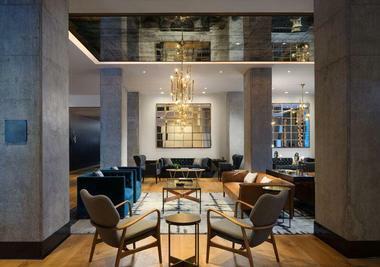 Located a block from the Boston Common in downtown Boston, the Kimpton Nine Zero Hotel Boston is a hip and contemporary boutique hotel that offers chic guest rooms, upscale amenities and facilities, and a pet-friendly policy. 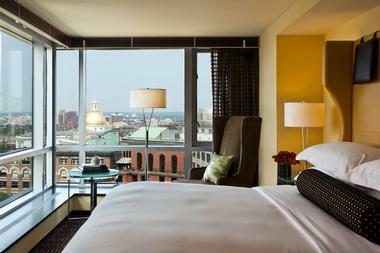 Situated a short walk from the Downtown Crossing station and the Freedom Trail, Nine Zero Hotel features sleek rooms and suites with skyline views, honor bars stocked with gourmet treats, free loaner yoga mats, and state-of-the-art technologies. A variety of spa services are offered, along with complimentary wireless Internet, and free perks include morning coffee and tea, a nightly wine reception, and bikes for exploring the city. Pets are welcome at the Kimpton Nine Zero Hotel with an array of specialized services and hotel amenities, such as a director of pet relations to take care of any issues, healthy food, water bowls and mats, plush pet bed loaners, courtesy bags for walking your dog, and a list of nearby pet-friendly restaurants, parks, groomers, and pet boutiques. Set on 12 acres of beautifully landscaped gardens and grounds half a mile from William B. Umstead State Park, The Umstead Hotel and Spa is a premium hotel that offers comfortable accommodations and a pet-friendly policy. Overlooking the tranquil waters of a lake, the hotel offers plush rooms with en suite bathrooms and soaking tubs, spacious living/dining areas, modern amenities such as coffeemakers and satellite television, and private balconies with lake views. 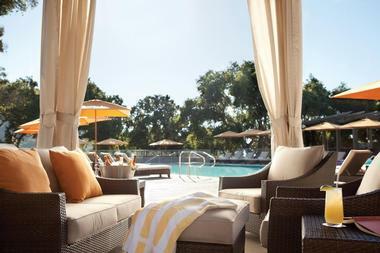 Facilities at the hotel include a deluxe day spa area, a seasonal outdoor swimming pool with cabanas, a poolside cocktail bar and acclaimed restaurants, a fitness center, and bikes for loan. Pets are welcome, and there is an enclosed playground for dogs to play called DogWoods. 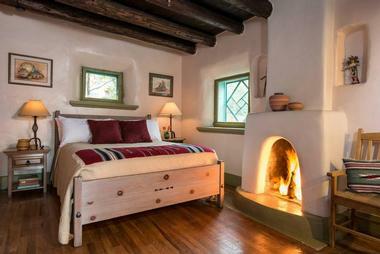 Inn of the Turquoise Bear is a family and pet-friendly adobe-style hotel in Santa Fe. Situated just over a mile from the Santa Fe Plaza and Museum Hill, the beautifully maintained hotel, which has sections dating from the mid-1800s, features individually decorated guest rooms with comfy Southwest furnishings, kiva fireplaces, and bathrooms with antique claw-foot tubs. A full hot breakfast is served every morning, along with complimentary afternoon snacks, and the property is surrounded by beautiful grounds with stone benches, flagstone paths, and pine trees, where dogs can be walked and played with. Pet amenities and services include in-room water and food dishes, water dishes on the central front patio of the inn, welcome treats, an in-room sleeping pad, pet waste disposal bags, and listings and maps for pet services, such as veterinary care, suggested walking routes, and pet-friendly establishments. The Cosmopolitan is a chic casino hotel situated on Las Vegas’ Strip that offers a luxurious and pet-friendly retreat in the city of bright lights. Located across the street from Planet Hollywood, the stylish hotel boasts breathtaking views of the world-renowned Bellagio fountains and is a short drive from McCarran International Airport. 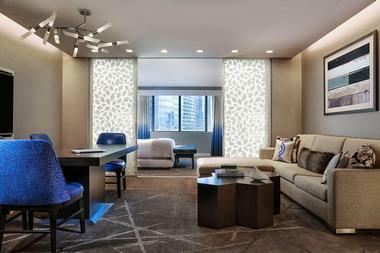 The Cosmopolitan features sophisticated guest rooms with kitchenettes, living rooms, en suite bathrooms, and floor-to-ceiling windows with spectacular views. 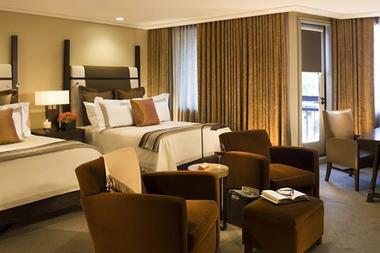 Upgraded suites rooms have private balconies, swimming pools, terraces, and butler services. The hotel is home to world-class facilities such as a casino, three swimming pools, an exclusive spa and hammam, a gym, an outdoor performance venue, an ice rink, and a wedding chapel. The luxury hotel offers a selection of services for guests with pets, including two outdoor dog runs for walking your dogs, and individual PUPJOY boxes, which contain premium treats and toys, chews, and accessories such as a collapsible water bowl for guests to keep and a pee pad. 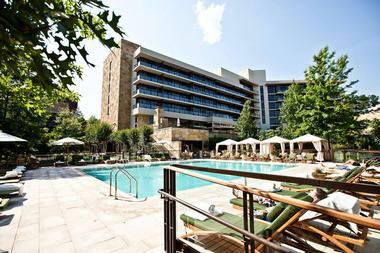 Located a short walk from Lady Bird Lake, Kimpton Hotel Van Zandt is a stylish and sophisticated hotel in the heart of Austin’s Rainey Street Historic District. Situated a few miles from the Bullock Texas State History Museum and an array of lively eateries and bars, the boutique hotel features comfortable guest rooms with floor-to-ceiling windows and gorgeous city views, en suite bathrooms with soaking tubs, living rooms with pull-out sofas, and kitchenettes with appliances. Luxury amenities include yoga mats and complimentary wireless Internet, and the hotel boasts a chic restaurant and bar, a relaxed café, a 24-hour gym, and a beautiful rooftop pool with a hip bar and an outdoor fireplace. Kimpton Hotel Van Zandt welcomes four-legged friends with a range of exceptional amenities and services such as courtesy bags for walking your dog, plush pet bed loaners, healthy food, and water bowls and mats. They also supply a list of nearby pet-friendly restaurants, parks, groomers, and pet boutiques as well as a director of pet relations to take care of any issues. 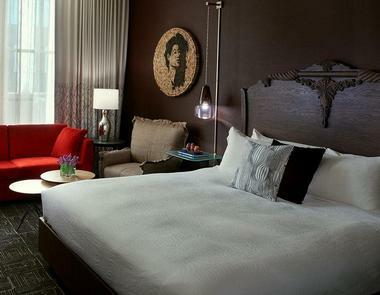 Set in a historic building close to the Salt Palace Convention Center and Temple Square, the Kimpton Hotel Monaco Salt Lake City is a hip, luxury hotel that offers deluxe accommodations, upscale amenities and facilities, and a pet-friendly policy. 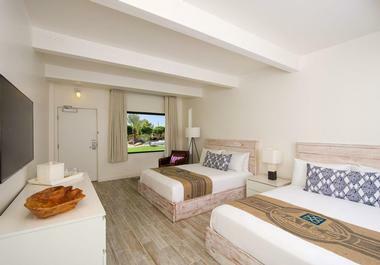 The hotel features bold, stylishly appointed guest rooms with living areas and pull-out sofas, wet bars, dining tables, and en suite bathrooms with double whirlpool tubs. Modern amenities include yoga mats, iPod docking stations, and complimentary wireless Internet, and facilities at the hotel include a restaurant serving New American cuisine, a fully equipped fitness center, ski services, and the use of bikes. Kimpton Hotel Monaco SLC welcomes pets as much as they appreciate guests and offers a variety of services just for four-legged friends, such as a director of pet relations to take care of any issues, plush pet bed loaners, food, water bowls and mats, courtesy bags for walking your dog, and a list of nearby pet-friendly restaurants, parks, groomers, and pet boutiques. 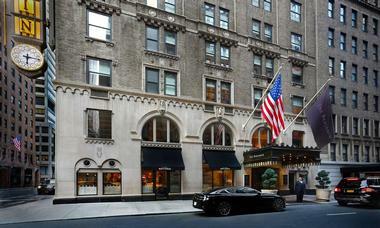 Located on Washington Street and surrounded by New York City icons such as One World Trade Center, the Brooklyn Bridge, and the Statue of Liberty, W New York is ideally placed to explore “the city that never sleeps.” The pet-friendly hotel features well-appointed rooms and suites with contemporary-chic décor, en suite bathrooms, and modern amenities, and upscale facilities include a state-of-the-art fitness center, two restaurants, and an outdoor terrace overlooking the city. The hotel offers a variety of exceptional services for pets, including the P.A.W. program, which is designed to make pets feel welcome. Amenities include toys and treats on arrival, W Hotels pet tags, custom W pet beds, food and water bowls with floor mats, and a pet-in-room door sign. Pet services can be arranged via the concierge and include dog sitting and walking services, grooming services, litter boxes, waste removal bags, pet first aid kits, and locations of dog parks, dog runs, veterinarians, and pet stores. Located half a mile from Governor Tom McCall Waterfront Park on Willamette River, Hotel Vintage Oregon is a trendy, upscale hotel with comfortable accommodations, deluxe amenities and facilities, and a pet-friendly policy that welcomes all pets. Situated a short walk from the Portland Art Museum, the hotel features chic and individually decorated rooms with sitting areas, minifridges, private bathrooms with whirlpool tubs, and balconies with outdoor hot tubs. Luxury facilities at the hotel include a casual Italian restaurant, wine tasting sessions, and a 24-hour fitness center. Pets are welcome at this hotel, which offers specialized services such as a director of pet relations to take care of any issues, and a selection of hotel amenities, including healthy food, water bowls and mats, plush pet bed loaners, courtesy bags for walking your dog, and a list of nearby pet-friendly restaurants, parks, groomers, and pet boutiques. Nestled in the heart of downtown Nashville, The Hermitage Hotel is an elegant and historic hotel that evokes a sense of timeless charm and grace. Designed in the distinctive beaux arts style, the grand hotel boasts an Old World blend of classical Italian and French Renaissance and features stylish, sophisticated, and comfortable guest rooms and suites with generous living spaces and beautiful city views. Luxury amenities include an on-site fitness and wellness center, an exclusive spa and salon, a business center, and a range of excellent dining establishments. 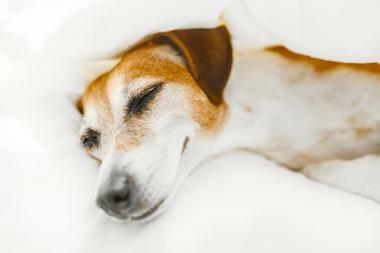 The Hermitage Hotel welcomes pets with an array of specialized pet services, such as a nightly pet turndown service, pet treats, spring water, in-room dining menus for pets, rolled towels, on-call pet masseuse services, and optional pet walking services as well as healthy treats and spring water. In-room pet amenities include luxury pet bedding, organic welcome gifts, bottled spring water, natural pet food, and water and food bowls.